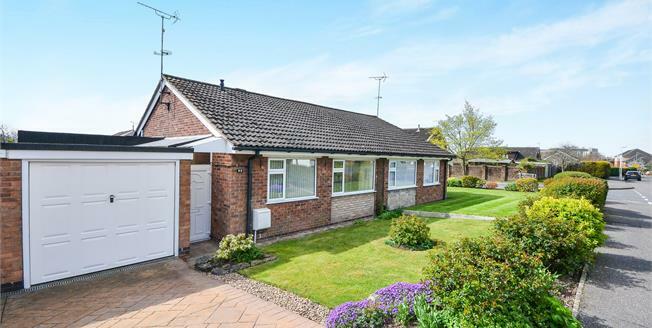 Frank Innes are pleased to welcome to the market this well presented two bedroom extended semi detached bungalow that needs to be viewed as there is more than meets the eye with this property. The property comprises of entrance hallway, fitted kitchen with space for appliances, main lounge which is a generously sized living space along with separate lounge which could be used as a dining room or snug, master double bedroom with fitted wardrobes, WC, second double bedroom and lastly the main bathroom with double shower, sink and toilet. To the rear of the property is a stunning private rear enclosed garden. The property also has an integral garage which is great for storage along with having a driveway. The property benefits from being double glazed throughout, gas central heated and in a well looked after condition throughout. Double glazed uPVC window facing the rear. Radiator, tiled flooring, ceiling light. Roll top work surface, wall and base units, single sink. Double glazed uPVC window with obscure glass facing the side. Radiator, tiled flooring, ceiling light. Low level WC, walk-in shower, vanity unit. Double glazed uPVC window with obscure glass facing the side. Radiator, carpeted flooring, ceiling light. Low level WC, vanity unit.